… And seen by 33 million people per year! © Copyright Alexander P Kapp and licensed for reuse under this Creative Commons Licence. 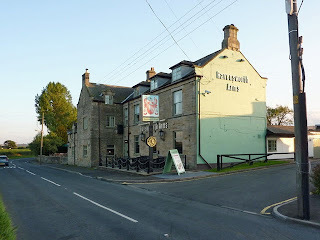 The Ravensworth Arms pub in the tiny village of Lamesley, a little to the south of the Team Valley Trading Estate, has connected to it two rather significant literary stories. The detail is brief, sketchy and may never be provable one way or the other, but the ‘facts’ are remarkable none the less. We have come across the great Catherine Cookson before on this blog. Well, it transpires that had it not been for a chance encounter at our drinking hole in Lamesley, the literary world would never have been blessed with the storytelling skills of our famous Dame. For though Cookson was born in Tyne Dock, she was actually conceived during a fling between her unmarried mother, Kate McMullen, and one of the punters of The Ravensworth Arms. Kate just happened to be working there at the time (in late 1905), when in walked the shady Alexander Davies – about whom very little is known – for a brief, but very productive, encounter. Davies is supposed to have been a fairly well-to-do native of Lancashire – and a bigamist and gambler by some accounts – but he soon disappeared from Catherine’s life – probably before she was born, in fact. Even less is known about the other ‘writing link’ of note. It seems that around four decades or so beforehand, the soon-to-be-famous Lewis Carroll had stayed at the pub for a spell. 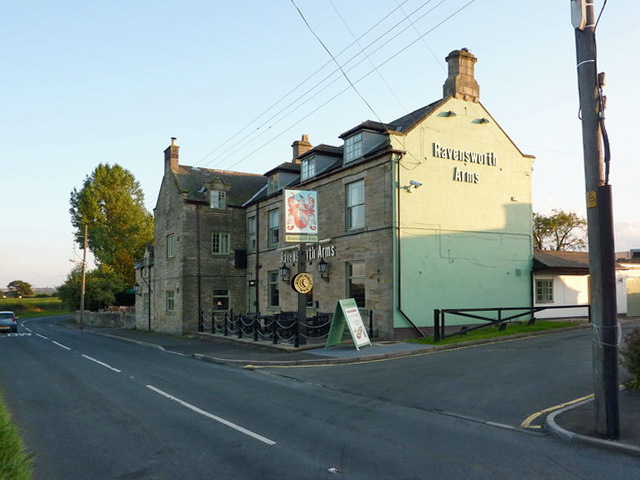 Not so remarkable you may think, but it is believed that he was working on his ‘Alice’ adventures at the time – enabling The Ravensworth Arms, Lamesley, to claim another notch on its literary bedpost. The town of Washington enjoys an elevated status in the annals of history for obvious and very well known reasons: its ‘Old Hall’ is the ancestral home of George Washington, a rather important eighteenth century American. But even the most devoted local would be forced to admit that their town’s claim to fame is a tenuous one. The ancestry of America’s first president does indeed stretch back to Washington Old Hall – or at least to the building which formerly occupied the site. But the big ‘clincher’ for most interested parties – including the many visiting American tourists – is, of course, the name. There’s no denying, however, that the gap between the last of the family to bear the name who lived at the hall and the birth of George himself is a very large one indeed. It is with one William de Hertburne – a direct forebear of George – that the story begins. 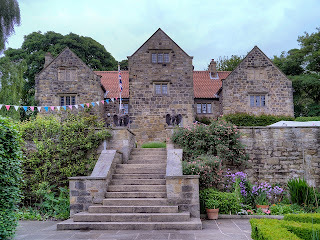 William it was who moved from Hartburn, near Stockton, to the area then known as ‘Wessyngtonlands’ in the twelfth century when he rented lands there from the Bishop of Durham. He then changed his name to William de Wessyngton, which in time came to be spelt ‘Washington’. The Washington family line of the future president seems quite quickly to have angled off elsewhere. In 1367 they migrated, first, to Lancashire; then Sulgrave Manor, Northamptonshire, from 1539. The family subsequently made its home in Essex, then Yorkshire, and finally, in 1656, they emigrated to the American colonies. So, as far as I can tell, the last direct male ancestor of George Washington’s to live in the town in Co.Durham that bears his name did so in the fourteenth century – and George wasn’t born until 1732. Though other branches of the family hung on in the North-East, the hall/estate passed through several hands before being sold back to the Bishop of Durham in 1613, and thereafter rebuilt on its original foundations. One individual more than any other helped spread British influence and drive its foreign policy in the Middle East in the early twentieth century. 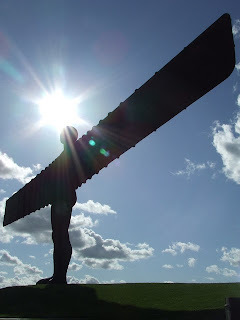 Moreover, that individual was a single, unmarried woman … and she was born here in the North-East of England. Her name was Gertrude Margaret Lowthian Bell. Born at Washington Hall (now known as Dame Margaret Hall), a little to the south of Washington Old Hall, Gertrude entered this world in July 1868. She was the daughter of a well-to-do family whose general wealth enabled her to indulge her passions and interests across the globe to considerable effect. Although her mother died when she was three, she enjoyed a privileged upbringing and graduated from Oxford University before she was 20. Thanks to her family contacts, she was afforded the opportunity of an early visit to Persia in 1892 – and stayed overseas for a decade, travelling widely and writing profusely. She was passionately interested in history, archaeology and languages – dabbling, too, in mountaineering – and began spending more and more time in Syria and Palestine in the years immediately before the First World War. The delights of the Ottoman Empire, Mesopotamia, Arabia, Babylon and many other exotic places were also devoured by her insatiable appetite for knowledge. She served with the Red Cross in France in the early stages of World War I, before returning to the Middle East, where the British government used her in an official capacity to help shape and build their imperial ambitions. Her knowledge and relationships with local tribesmen paved the way for many a British success in their international manoeuvrings with the Arab nations. 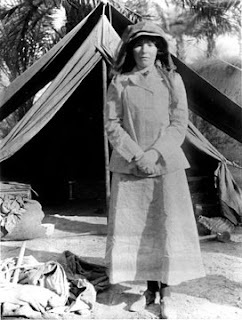 Gertrude worked periodically alongside the famous T.E.Lawrence during this period – essentially as a spy during hostilities. From 1915 until her death in 1926, Bell spent most of her days in the country now known as Iraq, helping to establish its borders (among other things). For several years leading up to her death in Baghdad, she served in the Iraq British High Commission advisory group and was a confidante of King Faisal. She effectively acted as a mediator between the burgeoning Arab government in Iraq and the British government (who were keen to see Iraq established as a self-governing state). She was awarded a CBE for her considerable efforts in the region over many years. In addition to all of this, Bell did much to preserve the new Iraq’s heritage and culture, thanks to her interest in archaeology and history. The setting up of the National Library of Iraq and the Iraqi Museum were largely down to her. The strain of her workload made her frail, and she eventually died, aged 57, soon after a bout of pleurisy in July 1926 – possibly from an overdose of sleeping pills. She may or may not have committed suicide. Such was her reputation that her funeral in the Iraqi capital was a major public event. It is fair to say that the lines Gertrude Bell helped to draw in the sands of the Middle East during the creation of Iraq (and Jordan, in fact) have indirectly led to the troubles of late in the region. But Bell herself certainly foresaw these problems, and made the best of what may be considered an almost impossible job. In fact, if others since had been blessed with the diplomatic skills of the frail little spinster from Washington, Co.Durham, then things may have panned out a good deal better in this tender part of the world. 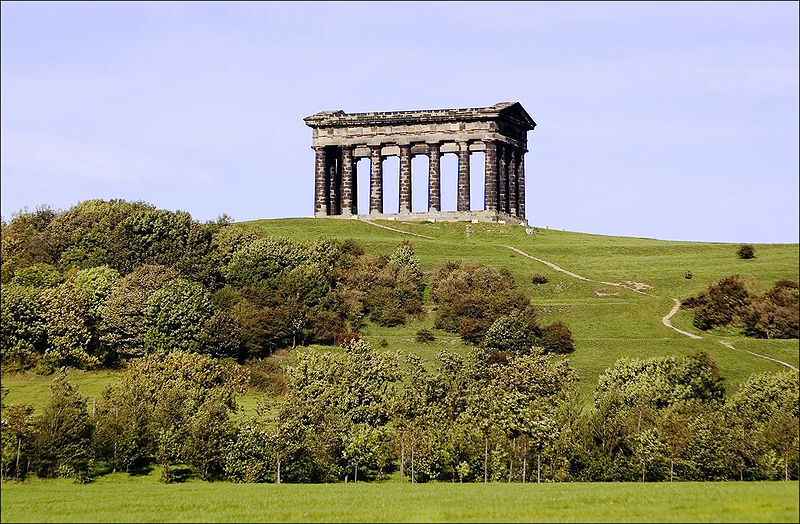 Perched high over the River Wear on a grass-covered mound at a height of some 450ft stands the distinctive outline of one of the region’s most prominent landmarks: that of Penshaw Monument. Offering outstanding panoramic views to those who take the trouble of scaling its lofty heights across the Wear basin and beyond towards the vast tracts of lower Tyneside, this most classical and unlikely of creations dominates the skyline for miles around. Formerly known as Pensher Hill Monument, the site itself is perhaps best known as the night-time lair of the legendary Lambton Worm (though some claim that nearby Worm Hill is the better bet). The medieval monster, whose dirty deeds are recalled in many varied versions of prose, is said by one such account to have slept coiled “ten times round Penshaw Hill”, from which it crept nightly to prey on local livestock and young children. It was in honour of a Lambton, in fact, that the present structure was ultimately erected many centuries later in 1844. The famous County Durham family had long owned the hill, and it was to the memory of one of the most famous of their clan that the temple was raised by his contemporaries. Radical ‘Jack’ Lambton, later to become Sir John George Lambton, enjoyed an illustrious career prior to his somewhat premature death at the age of 49 in 1840. Having represented the county of Durham for fifteen years as an able Member of Parliament he went on to become the first Earl of Durham, and ultimately held the prestigious offices of Lord Privy Seal and that of the first Governor-General of Canada (among other titles). By all accounts he was a well respected gentleman: humanitarian, well and widely educated, multi-talented and amiable, he would most probably have been embarrassed by the lavish tribute afforded him by his colleagues and subjects in the wake of his death. No expense was spared: top local architects – the father and son partnership of John and Benjamin Green (who had only a few years previously completed two of Newcastle’s most famous landmarks, the Theatre Royal and Grey’s Monument) – were commissioned to the task, and soon the plans were complete. The opening ceremony – the laying of the foundation stone – took place on Wednesday 28th August 1844, and was conducted by Thomas, Earl of Zetland, who bore the illustrious title of Grand Master of the Free and Accepted Masons of England. Over 30,000 locals are said to have witnessed the occasion. The finished monument – based on the famous Temple of Hephaestus (or Theseus) in Athens – measured, or rather measures, 100ft by 53ft in length and breadth, and is 70ft high, with eighteen columns in the classical style, each 6ft 6in in diameter. A monument fit for a god, never mind a Lambton! 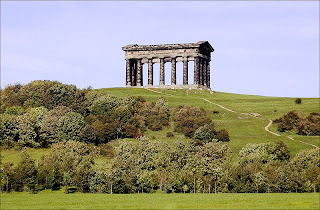 Make no mistake, Penshaw Monument is no folly – nothing could be further from the truth. Now in the capable, caring hands of the National Trust, it is open to the public all year round during daylight hours – though access to the top of the monument itself is restricted to weekend tours in the summer.